The U.S. House of Representatives has not just left town, but prior to leaving passed a rule preventing any member from using the War Powers Resolution to force Congress to return and vote on war. 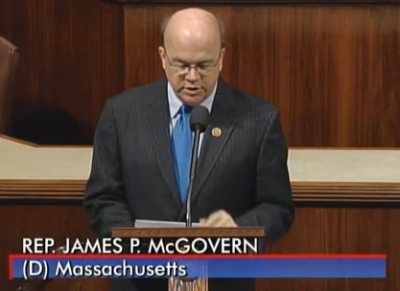 If you watch the video, following Rep. McGovern’s remarks two of his colleagues run their mouths. The first is Congressman Pete Sessions nonsensically replying to McGovern. The second is Congresswoman Virginia Foxx on an unrelated topic. If you jump ahead to 10:25 McGovern replies to Sessions. It’s well worth watching. In addition, Congressman McGovern and five other Democrats and six Republicans have asked Speaker John Boehner and Minority Leader Nancy Pelosi to hold a vote on war. Here’s their letter: PDF.